Republicans created a massive loophole in their recently passed tax law that could have serious consequences for the agricultural industry. Lawmakers are trying to fix what’s become known as the “grain glitch” as part of the negotiations over this week’s massive spending bill. 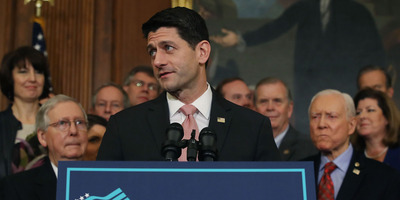 Negotiations are at an impasse after House Speaker Paul Ryan rejected a deal from Democrats. Republicans are trying to correct one of the biggest mistakes in their recently implemented tax overhaul but are having trouble agreeing on a fix. A tweak to taxation of agricultural corporations and co-ops in the new law opened up a loophole that could cause a significant distortion for the industry and lawmakers, particularly from farming-heavy states. Lawmakers are trying to put a fix in this week’s massive spending bill. The error, which has become known as the “grain glitch,” stems from a provision in the tax law that allows for a new 20% tax deduction on income derived from a pass-through business – in which the owner of the business takes the profits directly as income. The change would likely drive some smaller agricultural distributors classified as corporations out of business. And it opens up a loophole through which high-income individuals could funnel money through farms. Agricultural businesses have called for Congress to pass a bill to tweak the language and make sure that the tax code is not overly preferential. The biggest obstacle to fixing the grain glitch is a larger divide over fixes for the tax law. Republicans almost immediately admitted that the law would need technical corrections, as do many laws of massive size. Democrats, who universally opposed the tax law, have been reluctant to support any such move, noting that the GOP has refused to help shore up the Affordable Care Act, or Obamacare. While Republicans argue the tax law is a different beast, the two sides have been left at an impasse searching for a hard-to-find fix. To ensure the grain glitch – one of the biggest mistakes in the bill – gets corrected, Republicans are attempting to add a correction to the must-pass spending bill this week to avert a government shutdown. Democrats have reportedly offered to attach the grain glitch to the omnibus bill in exchange for an expansion of the low-income housing tax credit, which incentivizes states and cities build such housing. House Speaker Paul Ryan rejected the offer on Tuesday, but reports Wednesday indicated a last-minute negotiation got the change into the bill in exchange for the housing credit boost.